Happy Monday everyone! I've had a an awful week and I was in the depths of depression(hence no posts)! I'm being a tad bit dramatic but really, it hasn't been pretty! I Just need Friday to come so I can go and see my baby's mother in concert and all will be right with the world again! I just feel like Rihanna's energy (and a few drinks) can fix a lot of things ya know?! The thing that I'm getting right these days though, is my evening skincare routine! I don't want to toot my own horn or anything BUT I have my routine nailed and my skin is really loving it! I mentioned in this post that I had a phase during the winter when my skin was starting to be really dry and I pulled out some old trusties but then I decided I just needed to find a system a worked and by Jove I have! A friend asked me to share what I was currently doing, so I hope it helps you as well! I have combination skin (dry in areas and oily in others) and this routine works for me so if you have a similar skin type it should work for you too (you're welcome) and if you have a different skin type, you just need to switch out the products for what works for you! Simples. Recently I've become a massive fan of the Simple wipes (Boots currency has them on offer) but I sometimes use baby wipes (read: they do the same thing) for this step because all you need to do it remove the grossness that has been sitting on top of your skin from the day. As someone who is oily in the t-zone and sweats for than other people I find that this step is a good way to ensure that the products I use in the next step properly get absorbed into my skin. This is a Major key! 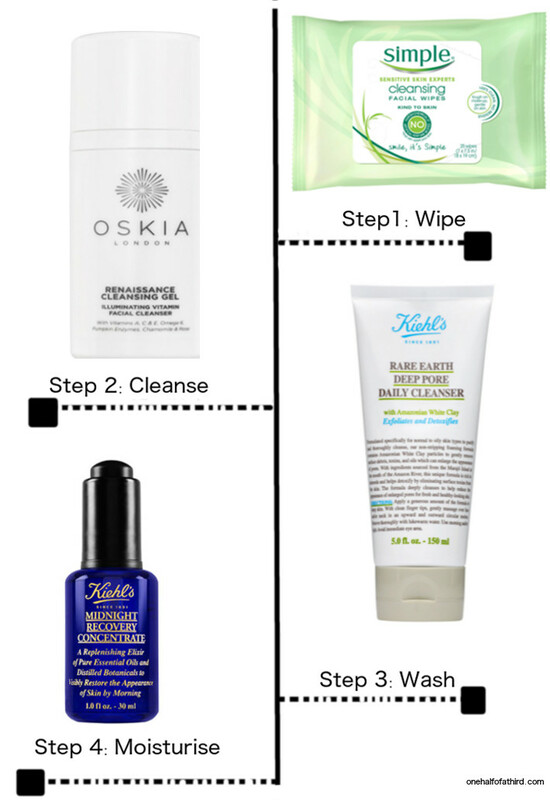 I love love love the Oskia Renaissance Cleansing Gel. This is one of those products that I kept seeing on a lot of beauty blogs and after suffering from FOMO I took the plunge and bought it and I am so glad I did! It's an oil type gel that just glides on your skin and leaved it feeling clean and moisturised. I usually pump some onto a cotton ball and cleanse off anything that the wipes left over. Because it's oil based it picks up tougher to remove gunk off your face! Did I mention that I love this product? In the mornings I wash my face with either a bar of dove soap or a gentle face wash (see post here) but in the evening I prefer to use something a bit more abrasive. Your skin regenerates at night so I like to get rid of the dead cells before bed so I can wake up to some reborn baby soft skin! The Kiehl's Deep Pore Daily Cleanser is perfect because it's gritty but gentle enough that you can use it everyday without overworking your pores. If you read this post you will know the level of love I have for the Kiehl's Midnight Recovery Concentrate! This serum is specially made to help your skin regenerate at night so it's beyond perfect as a moisturiser for your night time routine! Honestly, everyone needs this product in their life because it makes your skin feel and look amazing! I know it's not the cheapest product out there but it lasts a long time because you apply a little at a time- it's seriously worth the investment (it's their best selling product for a reason). If you know any other great products that I should add/try let me know!! Oh and in case you didn't know, Kiehl's have samples for just about all the products they sell so you can walk in and just ask for a sample to try for a while before you decide to commit and spend money!